Tech Blog with latest tech news CopyShould Online File Storage Sites Tech Blog with latest tech news CopyShould!! 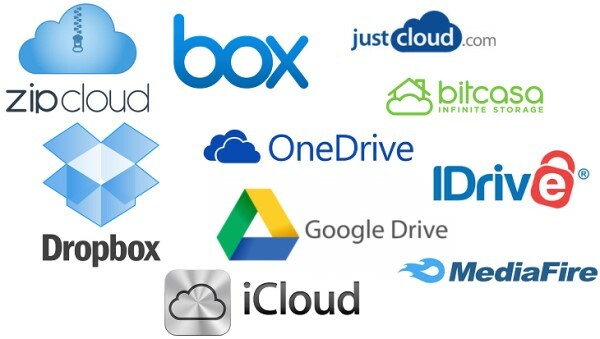 List of the best free online file storage sites. More than just external hardrives, many of these sites are collaboration platforms that you can use to share documents with friends. 1. Box: gives you 5 GB of storage for free and lets you organize your files into folders in the cloud, just like you would on your desktop. You can share links or entire file folders with others and see when they’ve been viewed. 2. Bitcasa: stores up to 10 GB worth of free files, photos, playlists, videos and docs that can be accessed from any device (and reportedly goes up to infinity for paying customers). 3. Dropbox: is a secure place to keep photos, documents, and videos that you can access from your computer, smartphone, or tablet. You can share the files with your social networks as well. It comes with 2 GB of free storage (or up to 18 GB if you refer a friend). 4. Evernote: saves all of your notes, web clips, files, scanned documents, and images. You can search for the documents by keyword, access them from any device, and share them with friends. The storage process here is a little different: free users can store up to 100,000 notes (up to 25 mb each), 250 synchronized notebooks, 10,000 tags, and 100 saved searches. 5. Google Drive: syncs documents, spreadsheets, presentations, and videos from your computer and mobile devices. It connects to Google+ and Gmail for collaboration and sharing. It has a free storage limit of up to 5 GB that’s shared between Google Drive and Google+ Photos. 6. iCloud: is just for iOS devices, but it syncs all your music, photos, apps, calendars, documents, and other files and makes them sharable with friends. It comes with 5 GB of free cloud storage. Bonus: the photos in your Photo Stream and whatever music, movies, TV shows, apps, and books you buy from iTunes don’t count against your storage limit. 7. Mega: Internet outlaw Kim Dotcom released this service one year after the U.S. government shut down its predecessor, MegaUpload, for facilitating copyright infringement. The new tool promises “state of the art, browser-based encryption technology” and a whopping 50 GB of free cloud storage. 8. SkyDrive: offers 7 GB of free cloud storage for photos, documents, and other files and works on any device. Windows 8 users can log in with their Microsoft accounts to view photos and files, edit and share Office documents, and share the files with friends. If you still need extra storage space, these companies will be more than happy to sell it to you. But unless you’re the Library of Congress, this should be enough to get you started.